Joe’s not big on publishing rumors — if Joe were, these pages would be filled with them — so Joe had to do some research on this source before posting this. Apparently, across the United States, a lot of reputable outlets are willing to quote Chad Forbes, who is found on Twitter pumping out all kinds of draft info from scouting-related events he attends. They include CBS Sports, and Forbes has been a guest on many sports radio stations including the powerful WFAN in New York. It seems Forbes has been a busy guy in St. Pete this week at East-West Shrine Game practices. Yesterday, among the many nuggets Forbes was Twittering, he claimed Bucs tight end Cameron Brate is available in a trade. 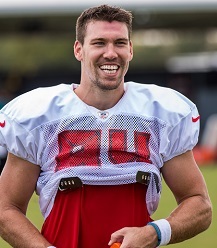 From #Buccaneers Source team won’t ‘Shop’ TE Cameron Brate but he’s available in a trade. Deep FA TE Class & Brate just signed extension last offseason. At $7M might be value & worth a draft pick. Bucs working through ideas on creating cap flexibility. Joe would understand a Brate trade. What’s more valuable to this team right now, a quality free agent cornerback or Brate? No, Joe is not lobbying to trade Brate, but there aren’t many teams paying their No. 2 tight end big money. Injuries might be a factor here — in multiple ways. O.J. Howard has finished both of his NFL seasons on injured reserve. And remember, Dirk Koetter said Brate was hurt “from Day 1” this season and Koetter wouldn’t comment when Joe asked him if Brate needed offseason surgery. Lastly, major roster overhaul is coming, which always means a fan favorite or two or three gets the boot. Might Bucco Bruce Arians might prefer to buy a running back? 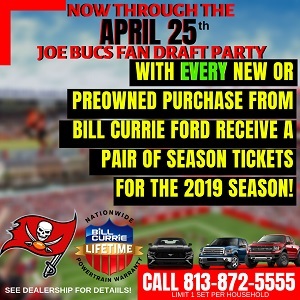 Joe…..I have asked repeatedly for information on Brate’s “mysterious” injury…..Koetter claimed he was amazed that Brate played at all……it seems odd that there would be no news regarding it. Either he regressed and the injury was an excuse or he regressed and had no injury. Now as for trading him…..I think BS….he is very much a favorite target for Jameis and if Jameis wants him, he will stay. This makes too much sense. Arians offense doesnt feature TEs so no need to keep Brate at his salary. This was always a deal to see how OJ would do in year 2… if he did well, then you trade Brate, if OJ did poorly, you keep him around. It’s a good deal in that sure, Brate got more money up front than you’d expect, but in exchange the team bought the ability to cut him at any time with no cap hit – which obviously means you can also trade him with no cap hit. Well handled by the front office for once. $4M of 2020 salary fully guarantees on the 5th league day of 2020. Well we have Ronald jones and J Rodgers. I suggested this last Aug . The Cap hit with OJ on the roster can’t work , this was a save our asses signing by Koetter and Licht !!! Prob not a team league wide would pay brate 7 mil but I believe the signing did create a trade value coming out of camp for a team that felt they were a weapon short . Again Light not creating value !!!!!! Rich McKay in a similar scenario traded Harold Bishop to the Browns for I think a second , Bishop def wasn’t as accomplished as Brate . A GM s Job is not just to sign its to create value Rich McKay was the Master of creating roster value . Brate has some similarities to Kelsey when targeted but let’s not confuse the two , especially after the catch !! Great player , Great Guy Just is only worth 3 mil on this roster !!! We have Auclair being used in the H-back and big sets. He’s proven to have sure hands when thrown to. If you were paying attention or look back, they weren’t otherworldly but not the simplest of catches either. He needs to stop getting caught holding all the damn time. Work the arms and grip machine or something! But I like him and he’s good on the cap. Fans always forget this is the season of lies. Trading Brate would be stupid. I get it but OJ Howard injured both years. The whole notion is goofy. And I think the only “fan favorite” that may be gone is GMC because of age, new scheme (especially if 3-4 is primary), and GMC’s $13M cap hit, which is up to him if he wants to take less and stay a Buc. With OJ the main guy and only other formidable TE with Stocker and even Cross–gone (leaving Auclair), the Bucs need the depth, and Brate doesn’t cost much either but brings great value. As much as I hope the Bucs dump Winston (he’s bad for the franchise face and business thus far), I doubt they will draft a QB in 2019 at 5th overall. With the four teams above the Bucs not really needing a QB, a team that does will pay the Bucs dearly to trade down. Trading down just a few can easily let the Bucs still get a CB or S, and a LT high up in the draft, and probably net another 2nd or 3rd round pick in the trade. Trading either Brate or Hump right now would be dumb. Not to mention, Brate had an slight pullback in 2018. He may be the “real” Brate we saw. Brate is probably more willing to be traded than the Bucs are to trade him…as clearly he’s like to be the #1 TE, and won’t be here as long as OJ is here and healthy. I’m just saying that of course the team shouldn’t trade him for anything less than a third, but I’m also not front office guru. It all comes down to what another team would trade for him, IMO. Keep him. Don’t screw this up. Someone get Kevin O’Donnell to ambush Cam Brate for a second time at one of our local dining establishments. Ya’ll that say BA doesn’t run two tight ends don’t watch much ball, he uses them a lot just not in the conventional way of lining them up next to the tackle. In a number of his 4 wide sets 2 of the receivers are TEs. Plus you always need quality depth, I hear ya’ll complain we have no depth and now you want to get rid of quality depth. Brate may not have the speed to make the big play like OJ but he is very reliable in making the first down and tough catches on Third down. I say keep him because of the added fact OJ has not made it through a year not getting hurt. Brate and Hump are both fan favorites and I’m sure the team would love to keep both but I’m not sure it makes business sense. I’m guessing they keep one of them. Personally, I’d rather have Hump. Either way aim glad the team has ignored passcatchers in the draft just based off of need. They continued drafting guys like Godwin & Watson. This makes it much easier to move on & will be huge in the future because good pass weapons don’t come cheap. Altered Ego……Auclair is terrible. I bet he had more fouls then catches this year. I will be happy to see him lose his roster spot to a better player this August. It would be nice if we could get a rb, ol, or a cb out of this if it were true. Makes sense to trade him. Love to see OJ work more seams this year. I hope Bruce saw the film on 2015 and saw Winston carving up the seams with ASJ……And yeah, Jenkins dropped more then he caught. But Winston showcased that the seam was probably his best throws. Don’t know or care anymore why Dirk took those plays off the game plan. What matters is our new HC says that he is going to gamplan around what our players can do. I take Bruce as a man of his word and I expect to see a ton of plays down the seams this year. @jmmyjack Well said. Couldn’t agree more. Auclair is a drive killa!! Dude had 7 catches for 48 yards and 0 TD’s. Brate Had 30 with 6 TD’s and played hurt all year which was stated in multiple games if you watch them. Yeah he can replace Brate- MORONS!! If I’m Arians, Auclair is one of the first people I cut. He is our “blocking TE” and cannot stop getting drive killing holding penalties. He also has had some ST penalties. Stop worrying about the Glazers money and what they pay people, Cap going up again, D Jax, Grimes off payroll, possibly GMC. We don’t know how Howard will respond in recovery. Would be silly to trade him- Give Humphries 5-7 mill a year for 3 years with 10 guaranteed- any more is insane- we have Bobo that can play in the slot, maybe Watson in the slot and certainly we can get some speedster in the draft or an UDFA. Maybe you use a 5th or 6th on the Clemson kid Renfrow. We have options. More impact players are needed and less plodders. Brate does not create a lot of separation and guys like him pop up all over the NFL landscape. Like MeSean he’s replaceable for half the price. Save $$$ where you can and pay the impact guys. If the Bucs trade Brate they should get at least a 4. Not that I condone trading him. I think they should keep him at least one more year to see if OJ can stay healthy. And they definitely need to sign Hump 7 or 8 mil. Forgot to mention if Bucs trade Brate, the Pats might be a good trading partner. TOM good idea. But I’ll say no to the 4th rounder. They got an extra Tackle on their roster right now. Player/player….straight up. And heck, I’m desperate. I’ll throw in a late rounder if need be. Future Patriot. Mark my words. Oh, Tom beat me to it. All depth in secondary needs to be replaced. Javion Elliot, Isaiah Johnson, etc. Deonte Adams looked good the second half of the year, but everyone else can take that long nap and be replaced with vets with experience on good teams. I WOULDN’T GIVE TWO SH!TS ABOUT TRADING JPP EITHER. THAT’S SERIOUS LOOT SPACE AND GUARANTEED TO GET PLAYER(S)/PICKS OR BOTH. Yup, 100%. Everyone thinks this is Madden. You gonna go into the season with just 2 tight ends lol? Auclair is still developing, he’s no Brate yet.